This entry was posted on February 23, 2011 at 2:59 pm and is filed under JP's Dedham. You can subscribe via RSS 2.0 feed to this post's comments. You can comment below, or link to this permanent URL from your own site. Wow, I’ve never seen one of those certificates. Cool! That was very nice of her. I don’t think I ever got one but sure could have used one. I was snowed in with my 3 and 3/4’s children (Scott was born in May)for a couple of days by myself. Someone couldn’t make it home from work. Right. I had to keep shoveling the snow away from the front door or it would have been blocked. Kristen helped. She was 5 and the snow was up to her waist. Yeah, I didn’t really “survive,” ’cause it was pretty easy. I walked around town exploring and taking pictures, enjoying an extra break from college and getting paid by the state for not working. 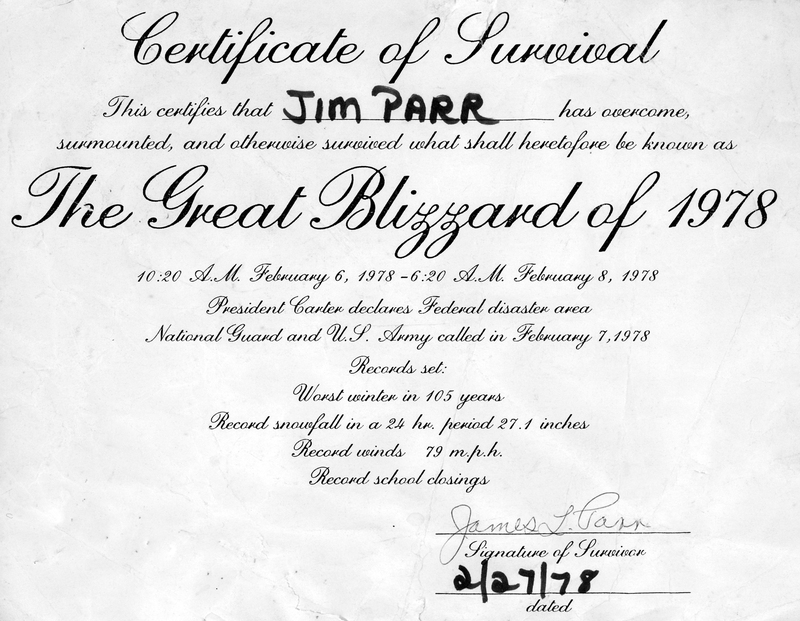 Happy anniversary of the great blizzard–thththirty-four years ago…thime flies when you’re having fun.